School pictures are the only pictures that are of just me. This is my FHS teacher badge that we wear to school. 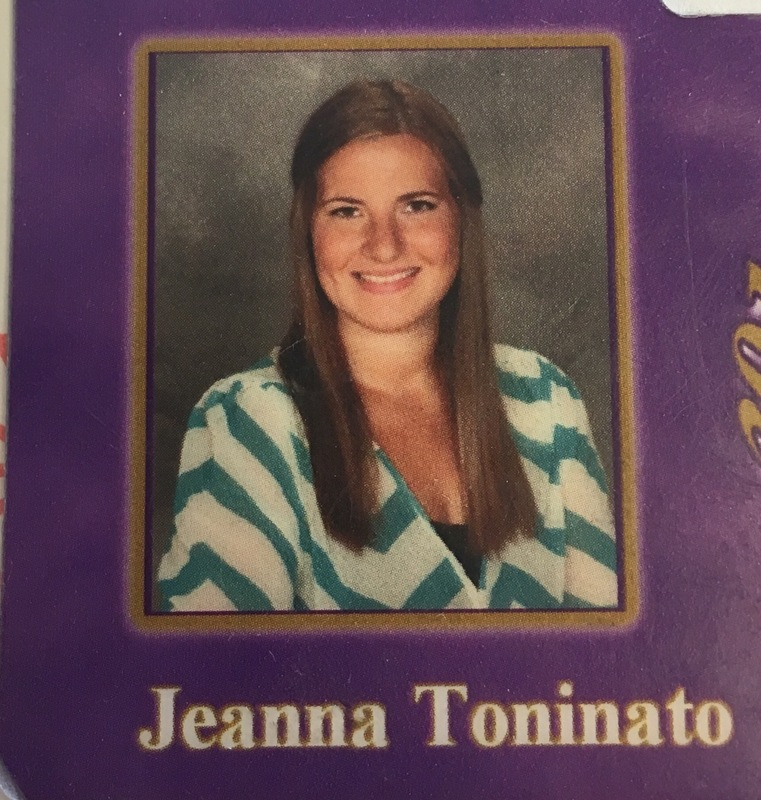 This is also the teacher photo in the staff section of the FHS yearbook. So after a week of research, reading articles, reading classmates’ posts, and looking at several blogs themselves (some I already read, and some I just started following a few days ago), I think I was looking at trying to find an answer the wrong way. I started out being so formal about the whole thing. I wanted to find ONE definition/answer of what a blog is and have all by questions to be able to be checked off and answered. How long do post need to be? How many pictures do you need? What is considered content of blogs? I realized that blogs are an ever-evolving thing and the minute you try to put blogs into a closed box/category, something changes so it bounces right out. From Jill Rettberg, I learned that there can be categories of blogs: “filter, diary, and topic-driven blogging”. For me, I liked that you can organize what a blog is by its content, but it still wasn’t a definitive answer for what a blog IS. To Travel the Great Beyond found a very interesting source by Jeff Jarvis that said “blogs are whatever they want to be”. There aren’t limits and boundaries to what can be considered a blog. The only limits created are created by you, which doesn’t mean those same rules apply to others. I touched on this in my original post about blogging that blogs are their own entity. They can be whatever I want for my own purpose. The saying “beauty is in the eye of the beholder” rings true for blogs. What I consider to be “blog content” might look different to someone else. Perspective is huge in this matter. Madelyn Haasken found a good article summarizing why people blog. It shows the positives of blogging and could incentivize more people to become bloggers. Rebecca Blood said,”I strongly believe in the power of weblogs to transform both writers and readers from ‘audience’ to ‘public’ and from ‘consumer’ to ‘creator’.” She saw blogging as a way for people to go from passively watching/reading to being able to participate. From everything I read, common trends I noticed about blogs and bloggers were people want to feel connected/included, and people wanted to feel important. As humans, I think we all crave that feeling of being wanted and heard. People blog because they want to understand the world and they want to be understood. It’s a way for people to connect even if other barriers stand in the way (distance, language, etc.). Blogs are a personal platform where your thoughts can be turned into information for mass consumption. It can be a no pressure/judgment place to share anything you deem important to share. His big message: Would you rather be RIGHT or EFFECTIVE? While doing some research about blogs and what bloggers do, I kept thinking about Blood’s article warning about what you read and write in blogs saying, “Their sarcasm and fearless commentary reminds us to question the vested interests of our sources of information and the expertise of individual reporters as they file news stories about subjects they may not fully understand.” I couldn’t stop thinking about that statement. As a teacher, I always talk about not taking everything you hear, read, or see as fact. It reminded me of the State farm commercial poking fun of people who read something on the Internet and accept it as the truth. This was an exaggeration of course, but it happens all the time. We read one article and the comments on it and most times see only one side. That does not mean that’s the only side. I’m thinking with blogging, where ANYONE can post about ANYTHING, we need to be both critical readers and writers. I think we need to be aware of personal bias. I was also wondering about monetizing blogs, a way to get paid for your blog. While reading 7 Ways to monetize your blog, it made me think of how bloggers could make money. They can have ads, but other ways to generate money is by talking about their sponsors and/or products. I have been reading a few blogs for a few years and when they talk about a product, I always wonder “Do you actually like/use that product, or do you just need to plug it in to get paid?” While reading blogs, I’m now checking for ads or signs that the blogger is making money and what their sponsors are. Everything you post to the public can be seen, even if you delete it. When sharing your thoughts and opinions might not be the best idea. Know your rights. There are legal guides for bloggers to help with this. Do your homework to protect yourself. So, the question of the week: what makes a blog a blog. We all use the word blogs and have an idea what is being talked about when someone says blog, but there doesn’t seem to be a definitive answer. Wikipedia has it’s own definition of a blog as a “discussion or informational website published on the World Wide Web consisting of discrete, often informal diary-style text entries (“posts”). Posts are typically displayed in reverse chronological order, so that the most recent post appears first, at the top of the web page.” After readings from Blood and Rettberg, I don’t think this definition covers what a blog can be. In chapter one from Blogging by Jill Rettberg, she breaks blogs down into three categories: diary, filter, and topic driven blogs. Diary blogs: like Dooce.com (which is hysterical by the way), are places where an author(s) can create and talk about anything, and usually they are the subject of their posts. They create snapshots into their life which they deem to be public information, unlike a diary where private moments are kept private. Filter Blogs: like the name suggests, are blogs that filter information for the reader. These blogs are used to find certain information and links and give you comments on said links. An example from Rhettberg’s reading is Metafilter, which has links to articles, blogs, and websites, and the author’s opinion and/or summary of it. Topic-driven blogs: Again like the name suggests, are blogs that usually chose a topic to focus on and to write about. For some reason, when I think of this type of blog, my first thought went to the term “mommy blogs”. “Mommy blogs” like Mommy A to Z focus on parenting: tips, tricks, advice, and a place where people can share their experiences with kids and parenting. You don’t need to be an expert; it’s where people who share certain interests or hobbies can have a platform dedicated to it. To me, this still doesn’t necessarily explain what a blog can entail. What is the blog in general? I think it’s more than just the different kinds of posts. I connected to Rettberg’s description that “blogs are not a genre, but a medium”. It’s not limited by the categories within them and it is not a category of something else. Blogs are their own entity. I thought Rebecca Blood shed some light on what blogs are. She writes that the term blog was coined after “Peter Merholz announced in early 1999 that he was going to pronounce it ‘wee-blog’ and inevitably this was shortened to ‘blog’ with the weblog editor referred to as a ‘blogger’.” Did anyone else think about the word WE while reading that? It makes me think of something anyone and everyone is included in while still being a part of some exclusive club. From what I gleamed off the reading, blogs are a sense of belonging. They are a way for people to participate in “the outside world” and/or “their own world”. First of all, let me start off with saying how terrified I was of taking this class. As I said in my introduction, I am not very good with technology. It definitely is pushing me out of my comfort zone and testing my patience while learning what feels like a new language, technology language. I don’t like the feeling of not knowing how to do something and when I’m not automatically good at it, I don’t like it right away (sounds bratty, I know). I had to remind myself several times what I tell my students all the time: “Calm down. If something doesn’t immediately make sense, you might have to read it again. Read carefully. Be patient. JUST TRY IT”. So far as setting up my blog goes, it has been a lot of trial and error and re-reading, but once something clicks, it seems way easier and gives me that boost of confidence in my abilities for this class. I truly think this class will be good for me being a teacher where some students “just get it” and some need more time and practice before they are able to do it. I definitely have more empathy already. I sometimes forget what being a student is like. Things that I teach make sense to me, but it is not the same for my students, who are trying new things for the first time. I think these weekly posts will help me reflect both on this class AND how my own teaching helps students who are learning. I’ve learned so many new things in the past two weeks, but I’m going to break it up into the things I found most important/helpful! That RSS is a life saver. My RSS post raves about how easy it is to keep all my sites organized in one place, and I can keep track of everything I’ve read. Linking keeps me sane! Again with my obsession to keep things neat looking, I love that you can link text into your document instead of having big long URLs in the middle of your blog post. I finally know the difference between tags and categories and am in love with both! It all clicked for me when I read from Lorelle on WordPress that “Categories are the site’s table of contents. Tags are the index words.” This was an excellent analogy for me. I added both widgets to my page so it’s helpful to find what I’m looking for. It’s also helpful for me to view other blogs to look up something by either categories, or key words instead of scrolling down the entire list to try and find something. Creative Commons is very customizable to fit every author’s needs, which is important in the ever growing and changing needs of the internet. In my CC post, I chose attribution-NonCommerical-ShareAlike (CC BY NC-SA) because I want people to be able to use my work, but still credit me and not be able to profit off of it. I’m still struggling with flickr helper. The flickr cc attribution helper has not been working for me in the way the guides and YouTube tutorials have showed me. The hints pop-ups tell me it might be my theme I’ve chosen for my blog is not compatible. Instead of the menu option Medium.com attributor, I have to use the default setting. If anyone else had similar issues or know any way to fix this, I would love to know. If you ever need a fundraising idea, I have two words for you: DONKEY BASKETBALL!! 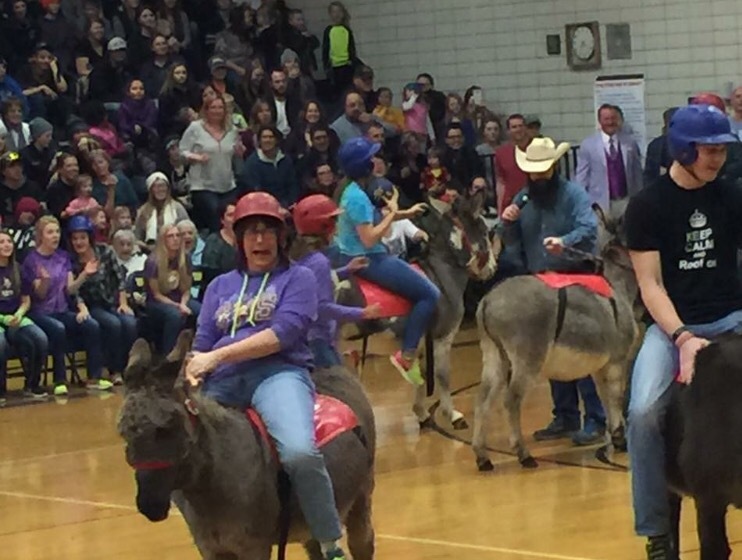 Our seniors are going on a trip this spring and to raise money, they hired a company from WI, Dairyland Donkey Ball, that brings these donkeys to you to ride and try and play basketball. Some of the teachers and faculty from FHS created a team, and I don’t remember the last time I laughed so hard!!! The donkeys have a mind of their own and kept bucking people off of them!! Our superintendent has a bruised hip from his shift in the game! It was hysterical to watch, and our students raised over $12000, so it was a success!! P.S. In the background, you can see our principal in the light purple suit (our colors are purple and gold). He was a part of the sanitation crew who were in charge of clean-up if the donkey had an accident during the game! This time last year it was -30° and today it was 36°!! I know for people who aren’t from MN, 36° is freezing, but for fellow Minnesotans, it felt like a heatwave! Today I went ice fishing with my fiancé and his family, and we didn’t have to set up our pop-up fish houses. We just sat on chairs and buckets outside on the ice. 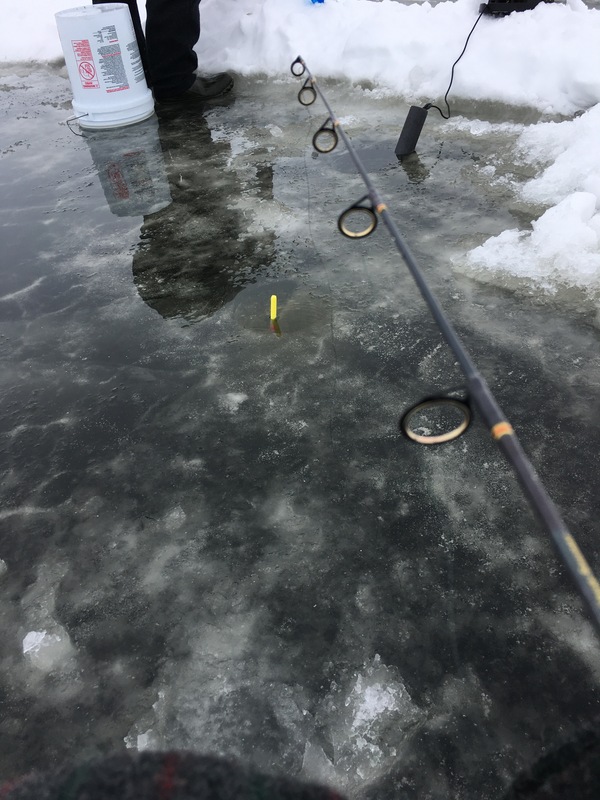 The only downside was the massive amount of snow that had melted from it being above freezing and turned into five inches of water on top of the ice. By the end of the day, we left with a small pond around us, and cold feet from slushing in water. I couldn’t get over how warm the weather was for the end of January!! With my hometown’s annual Icebox Days coming to a close this weekend, which celebrates us being named one of the coldest cities in America, it made me question could this really be The Icebox of the Nation?